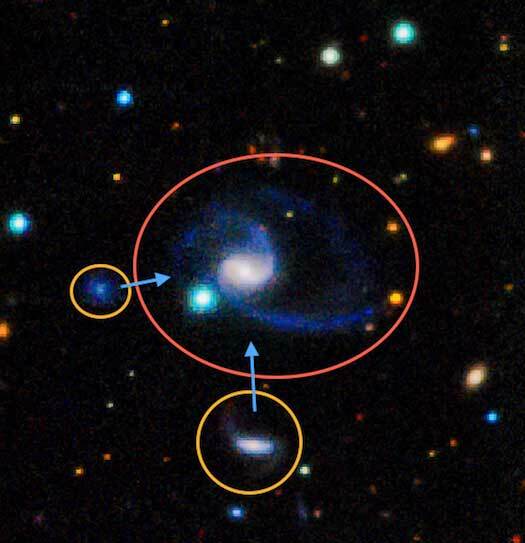 This image shows one of the two ‘exact matches’ to the Milky Way system found in the survey. The larger galaxy, denoted GAMA202627, which is similar to the Milky Way clearly has two large companions off to the bottom left of the image. In this image bluer colours indicate hotter, younger, stars like many of those that are found in our galaxy.Image Credit: Dr Aaron Robotham, ICRAR/St Andrews using GAMA data.